A few weeks ago I drove up to a Zen Buddhist Monastery. They conveyed to me that if I spent just 15 minutes a day meditating it would impact positively on my life. It's been a few weeks and I have yet to find even one 15 minutes. But I did find about 2 minutes to create a hole 'nother pipe. 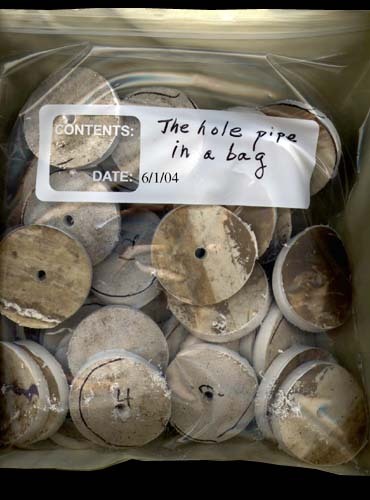 Inside the zip lock bag are the holes from the spray insulation pipe and some of the holes from the Rubber Hand Pipe. One thing spawns another.